Coordinators: Munawar M., Dixon G., Mayfield C.I., Reynoldson Trefor B., Sadar M.H. 1. International Conference on Environmental Bioassay Techniques and their Application: An environmental research and management view.- 2. The scientific basis of bioassays.- 3. Recent developments in and intercomparisons of acute and chronic bioassays and bioindicators?.- 4. The choice and implementation of environmental bioassays.- 5. 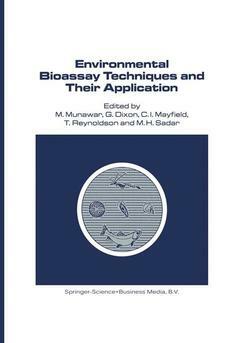 The application of bioassays in the resolution of environmental problems: past, present and future.- 6. The application of bioassay techniques to water pollution problems - The United Kingdom experience.- 7. The use of environmental assays for impact assessment.- 8. Probing ecosystem health: a multi-disciplinary and multi-trophic assay strategy.- 9. Functional bioassays utilizing zooplankton: a comparison.- 10. A holistic approach to ecosystem health assessment using fish population characteristics.- 11. Environmental impact assessment: the growing importance of science in government decision making.- 12. The role of microbial metal resistance and detoxification mechanisms in environmental bioassay research.- 13. Performances of three bacterial assays in toxicity assessment.- 14. Luminescent bacteria toxicity assay in the study of mercury speciation.- 15. Is the ‘Microbial Loop’ an Early Warning Indicator of Anthropogenic Stress?.- 16. On the accuracy and interpretation of growth curves of planktonic algae.- 17. A bioassay using the measurement of the growth inhibition of a ciliate protozoan Colpidium campylum (Stokes).- 18. The application of algal potential tests (AGP) to the canals and lakes of western Netherlands.- 19. A study of phosphate limitation in Lake Maarsseveen: phosphate uptake kinetics versus bioassays.- 20. Evidence from algal bioassays of seasonal nutrient limitations in two English lakes.- 21. Examination of the effect of wastewater on the productivity of Lake Zürich water using indigenous phytoplankton batch culture bioassays.- 22. Early warning assays: an overview of toxicity testing with phytoplankton in the North American Great Lakes.- 23. Continuous culture algal bioassays for organic pollutants in aquatic ecosystems.- 24. Round Robin testing with the Selenastrum capricornutum microplate toxicity assay.- 25. Phytoplankton recovery responses at the population and community levels in a hazard and risk assessment study.- 26. Functional response of Fucus vesiculosus communities to tributyltin measured in an in situ continuous flow-through system.- 27. Comparison of five bioassay techniques for assessing sediment-bound contaminants.- 28. Assessing toxicity of Lake Diefenbaker (Saskatchewan, Canada) sediments using algal and nematode bioassays.- 29. Fraser River sediments and waters evaluated by the battery of screening tests technique.- 30. Bioassay responses of micro-organisms to sediment elutriates from the St. Lawrence River (Lake St. Louis).- 31. Metal contamination in sediments and biota of the Bay of Quinte, Lake Ontario, Canada.- 32. Use of aquatic macrophytes as a bioassay method to assess relative toxicity, uptake kinetics and accumulated forms of trace metals.- 33. Bioassays with a floating aquatic plant (Lemna minor) for effects of sprayed and dissolved glyphosate.- 34. Phytomonitoring of pulverized fuel ash leachates by the duckweed Lemna minor.- 35. Sensitive bioassays for determining residues of sulfonylurea herbicides in soil and their availability to crop plants.- 36. Root and shoot elongation as an assessment of heavy metal toxicity and ‘Zn equivalent value’ of edible crops.- 37. Effect of acidity on acute toxicity of aluminium-waste and aluminium-contaminated soil.- 38. Do bioassays adequately predict ecological effects of pollutants?.- 39. The Daphnia bioassay: a critique.- 40. Life-tables of Daphnia obtusa (Kurz), surviving exposure to toxic concentrations of chromium.- 41. Toxicity of the new pyrethroid insecticide, deltamethrin, to Daphnia magna.- 42. Herbicide effects on planktonic systems of different complexity.- 43. A new standardized sediment bioassay protocol using the amphipod Hyalella azteca (Saussure).- 44. The valve movement response of mussels: a tool in biological monitoring.- 45. Physiological background for using freshwater mussels in monitoring copper and lead pollution.- 46. The application of combined tissue residue chemistry and physiological measurements of mussels (Mytilis edulis) for the assessment of environmental pollution.- 47. The biological assessment of contaminated sediments - the Detroit River example.- 48. A method for studying the impact of polluted marine sediments on intertidal colonizing organisms; tests with diesel-based drilling mud and tributyltin antifouling paint.- 49. The effect of heavy metal speciation in sediment on bioavailability to tubificid worms.- 50. Metal accumulation by chironomid larvae: the effects of age and body weight on metal body burdens.- 51. A terrestrial micro-ecosystem for measuring effects of pollutants on isopod-mediated litter decomposition.- 52. Scope for growth in Gammarus pulex, a freshwater benthic detritivore.- 53. Feeding and nutritional considerations in aquatic toxicology.- 54. Hypothesis formulation and testing in aquatic bioassays: a deterministic model approach.- 55. In situ and laboratory studies on the behaviour and survival of Pacific Salmon (genus Oncorhynchus).- 56. Analysis of fish bile with HPLC-fluorescence to determine environmental exposure to benzo(a)pyrene.- 57. The use of sheephead minnow (Cyprinodon variegatus) and a benthic copepod (Tisbe battagliai) in short term tests for estimating the chronic toxicity of industrial effiuents.- 58. Preliminary investigations on the influence of suspended sediments on the bioaccumulation of two chlorobenzenes by the guppy (Poecilia reticulata).- 59. Identification of developmental toxicants using the Frog Embryo Teratogenesis Assay-Xenopus (FETAX).- 60. Cellular and biochemical indicators assessing the quality of a marine environment.- 61. The role and application of environmental bioassay techniques in support of the impact assessment and decision-making under the Ocean Dumping Control Act in Canada.- 62. In-situ bioassessment of dredging and disposal activities in a contaminated ecosystem: Toronto Harbour.- 63. An improved elutriation technique for the bioassessment of sediment contaminants.- 64. Assessing the impact of episodic pollution.- 65. Acute toxicity of industrial and municipal effiuents in the State of Maryland, U.S.A.: results from one year of toxicity testing.- 66. Nitrification rates in the lower river Rhine as a monitor for ecological recovery.- 67. Conditional stability constants and binding capacities for copper (II) by ultrafiltrable material isolated from six surface waters of Wyoming, U.S.A..